If you’re unfamiliar with what a CSA is, it stands for “Community Supported Agriculture.” The function of a CSA stays true to its name. It’s a farm in which individuals purchase a “crop share” during the winter and early spring before the season begins. Then, throughout the growing season, share members either come to the farm weekly to pick up their already-paid-for shares of just-harvested vegetables, or they pick up their shares at a pre-determined location. Shareholders financially support the farmer in advance to grow fresh vegetables for them in the upcoming growing season. The content of each week’s share truly follows the seasons, as everything is grown from seed to seedling, tended, and then harvested on the premises. Most CSA farms either carry the “naturally grown” or “organic” label, which are fairly similar in their implication – no pesticides or chemical fertilizers, plus sustainable farming practices. In other words, vegetables you can really feel good about eating. Our focus is to provide quality organically grown and all natural foods from our farm, as well as from our network of organic farmers. This allows us to provide our customers with variety, and it allows us to support ourselves and community. Our CSA is 12 weeks long starting June 1st. We offer a full produce box for $33 a week and a half produce box for $17 a week. The full box consists of approximately 7-10 different seasonal vegetables, while the half box contains 4-6 different vegetables. We also make specialty items. For example, a variety of flavored butter, bread, herb-infused oils, herb-infused vinegar and delicious southern made cakes. All of our specialty items are available upon request and at select farmers markets. There are several ways to participate in our CSA. First, create an account and sign in. Please add either a full share or 1/2 share to your shopping cart. Check out. You may choose to purchase your share online via credit or debit card or you may click the offline terms. Offline terms mean that you can pay via mail using check or money order. An email message will be generated with details if you choose to pay offline. 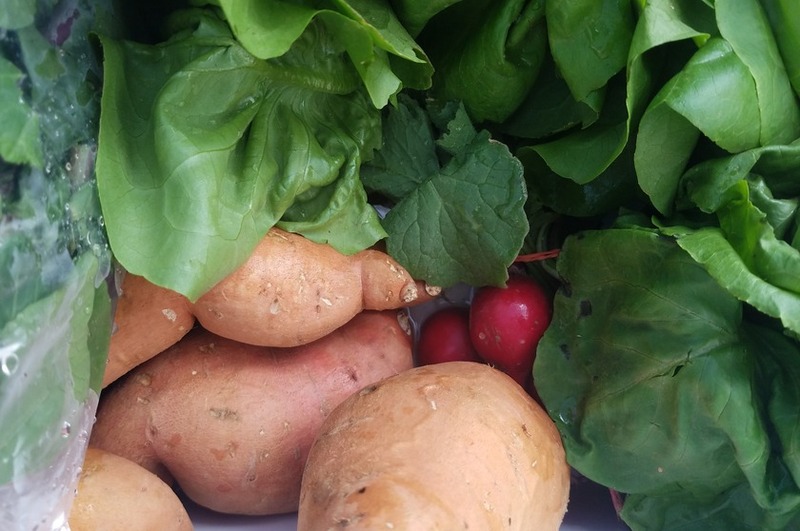 The first CSA veggie box will be available for pickup starting June 1, 2018, but we have other items that can be purchased at any time throughout the year such as butter, bread, oils, cakes, chicken coops, greenhouses, etc. Thank you for your participation and we look forward to growing together. Products Overview: Green Leafy Varieties (kale, collards, swiss chard/rainbow chard, turnips, mustards, spinach, etc.) Root Vegetables (radishes, beets, rutabaga, carrots, etc.) Lettuce Mix Brassicas (broccoli, cauliflower, and cabbage) Onions Corn Eggplant Watermelon Garlic Plums Blackberries Winter Squash Cucumber Zucchini Herbs (Basil, Sage, Rosemary, Mint etc) Organic Butters (blueberry Maple, Garlic herb, Strawberry Jam butter, Honey butter etc) Herb-infused oils/ vinegar and much more!